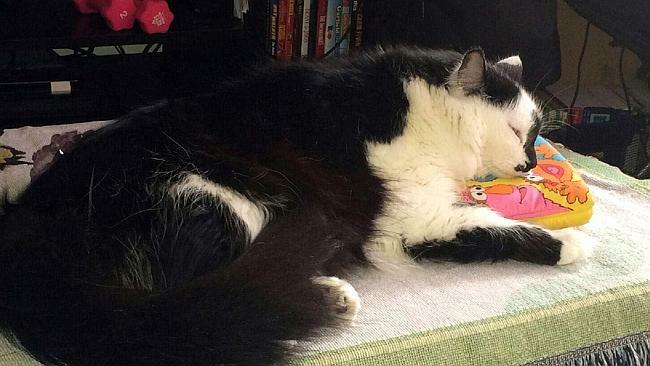 TERRIFIED family locked themselves in the bathroom and called 911 after their fat cat Lux went on a violent rampage and attacked their baby. Portland police had to be called to subdue the 10-kilogram Himalayan cat that trapped its owners inside their bedroom after attacking their baby. “I kicked the cat in the rear, and it has gone over the edge,” he told dispatchers. “He’s trying to attack us- he’s very, very, very, very hostile. Mr Palmer and his wife Teresa Barker grabbed their baby and dog and fled to their bedroom, barricading themselves inside to escape Lux. “I swear I have never seen anything like it, Mr Palmer told The Oregonian. Sgt. Pete Simpson said the operator could hear the cat screeching in the background as the couple waited for help to arrive. When cops arrived, the kitty suspect ran into the kitchen “attempting to flee custody”, police said. Officers used a dog snare to capture Lux from his perch on top of the fridge, and placed him in a crate. “The cat remained behind bars in the custody of the family, and officers cleared the scene and continued to fight crime elsewhere in the city,” Portland Police said. Sgt Simpson said the cat stayed with his owners and that the baby was not injured in the incident. “It’s only funny when it’s not happening to you,” Ms Barker told KPTV. This entry was posted in Cat News and tagged cat, Lux, pet cat lux on March 19, 2014 by Kitty Kelly.